If you’ve launched your WordPress website recently and thinking about the ranking of your site on the Search engines. Then, the first thing you need to do is to create a Sitemap of your WordPress site and submit it to Google Webmaster Tool. In this article, I’ll be showing you the way step by step to add your Sitemap to Google Webmaster Tool. But, before going to that point let’s discuss a little about Sitemap, and why it’s important to submit to Search Engines. So, What is a Sitemap Actually? Why it’s Really Important to Add Sitemaps to Google Webmaster? Basically, a sitemap is a document that lists all the URLs of your website (that you want to be crawled by Search Engines). Whether, the Document contains information such as the date a page was last modified or how frequently a page may change, and whether the page should be given priority over others. Example of a Sitemap is above. However, it’s also possible to create specific sitemaps for each type of content. For examples, one sitemap for blog posts, one for videos, one for images of your site etc. When it’s about the matter of ranking your WordPress Website, then you should create and submit your site’s sitemap to the popular Search engines, like Google, Bing, etc. Where the Google is the no.1, that’s why adding your sitemaps to the Google Webmaster is should be the first concern. Most of the WordPress site owners add their sitemaps, me too. The most important thing about a Sitemap is it helps search engines navigate your website more easily, by which way search engines index your content fast and better. Let’s think of your website as a building, whether the sitemap is the blueprint which informs search engines exactly where everything is located. So, it’s clear about the impotence of adding Sitemap to the Search Engines. Before preparing yourself to add your sitemap to the Search Engines, first, you need to create that. If you’re already a Yoast SEO Plugin user, you can simply create your sitemap using the ‘XML Sitemaps’ option of it. But, if you want the complete control over your sitemap creation, then read this article – How to create Sitemaps for WordPress Website? So, once, you created your sitemap it’s time to go ahead to the Google Webmaster Tool (for Google Search Engine). 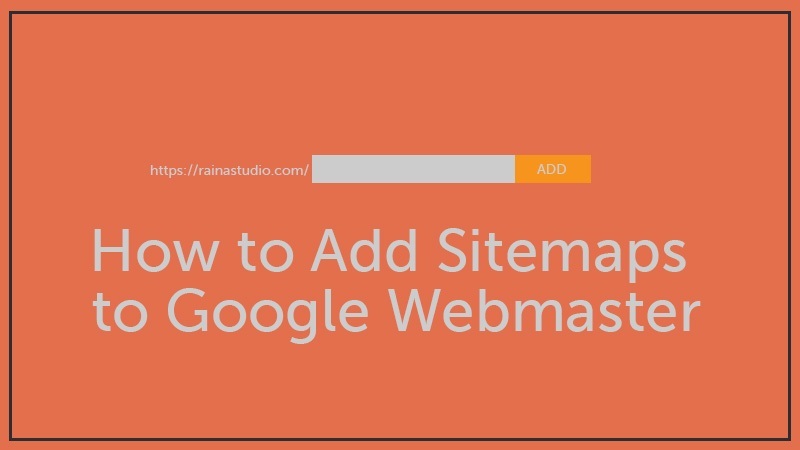 Just before adding the sitemap that you’ve created, you need to get a Google Webmaster account. For, this you need to have a Google account. If you already haven’t any, you can get it from here. After getting your Google account go to – https://www.google.com/webmasters/ and sign in. Once you sign in to Google Webmaster Search Console, you need to add a property (your site). So, put the URL of your Website into the box (however there is another option to add an Android app instead of a Website, we don’t need that). Now, click the ‘Add A Property’ button, then you’ll be asked for confirmation the ownership of your Website. There are two methods for doing this, Recommended and Alternative. I always prefer the Recommended method, whether you’ve to download an HTML file provided by Google and upload that to your website. So, let’s do this. Simply, download the HTML file that you can see on your browser. Then, log in to your hosting cPanel and open the public-html folder (where all types of your site files are located). Now, upload the HTML file that you just download. However, you can upload the file using any other way, such as using an FTP client like FileZilla. Just only make sure the file is uploaded successfully, the way isn’t the matter. So, your Website will be verified instantly by Google Webmaster and, you’ll get a confirmation notification including a link written ‘Continue’. This means the ownership verification is complete and now you can add your sitemap! So, simply click the link because we’ve to add the sitemap! Now, go to your Webmaster account Search Console page (here you may be asked to add your site property again if it happens, simply add your site again). Then, navigate the ‘Crawl’ option on your Search Console Dashboard and click on it. It’ll be expanded and where you can see the ‘Sitemaps’ option, simply click on it. Then, you’ll be landed another page where you can see ‘Add/Test Sitemap’ button in the right corner above. Click the button, and a little drop-down window will be opened, where you’ve to put the Sitemap URL of your Website. After, putting the URL, click the ‘Submit’ button. You can also test the sitemap before submitting it to be confirmed everything is oaky on the sitemap. Once, the submission is complete, you can see the sitemap is as pending. So, finally, the sitemap of your WordPress website is added to the Google Webmaster. Now, Googlebot will crawl your site according to the sitemap. It needs a couple of days or weeks to start getting indexed, and when it’ll start you can see the number of the indexed items from here. Hope, you’ve successfully added the sitemap to your Website to the Google Webmaster. If you found this article helpful, share it on your social account with your friends. As well as, you also welcome to share your potential opinion about this tutorial with us. Here we are, all together.